It’s no secret I love Disney World… and yes, I will get those 2013 reviews up soon! But recently, I had the opportunity to spend one evening in Orlando, so I took full advantage of this and made dinner plans with my friend Sarah at one of my favourite restaurants! Sarah runs a comprehensive gluten-free and dairy-free Disney World dining site… and, lucky her, she lives so darn close to the place that she goes ALL THE TIME. But this time, I got to join her, so we did a full-fledged review of our meal together! Sarah is gluten-free and dairy-free, but she does enjoy some meaty dishes, so FYI, those are included here (not unlike when I dine with my mom). Here we go! My words are in black, Sarah’s are in orange. ‘Ohana means family. And that means the restaurant ‘Ohana at Disney’s Polynesian Resort is a terrific place to visit with family and friends. Which is exactly what I did recently! My friend Laurie was in Orlando for the weekend, and we decided to head to ‘Ohana for a late dinner. Laurie has celiac disease so she is gluten free, and she is also vegan, so she took care of the special diets arrangements for the meal! Aw, well, thanks, Sarah! It was awesome being able to meet up with Sarah at ‘Ohana, and it was a good choice, too — we were famished! Before we headed over, I sent along the special diets request, and the chef emailed me beforehand to discuss a few details. I had a few questions, and wanted to see what they thought. You’ll read about these below! When we arrived, I was pleasantly surprised to see Chef Johnny who used to be the regular morning chef at Kona Cafe. I knew that he had moved over to ‘Ohana, but I thought he was only covering the mornings. It was great to see him there for dinner! It’s been awhile since we’ve crossed paths, so I think he was a little surprised to see me. Yep, you know you go to Disney too much when chefs recognize you! Well, some of us don’t have the luxury of living so close to Disney! But I do find that some chefs do recognize you when you come, especially if it is a restaurant that you frequent when you head down. When my mom and I head to Disney, we get recognized by a lot of the Table Service chefs, but I think that is because of our specific allergies and having the wheelchair in tow. I was really surprised to hear all the amazing things that they had planned for Laurie as a vegan. Honestly, ‘Ohana isn’t one of those places I immediately think of as vegan friendly, but it seems like they were nicely able to accommodate her. Her sushi looked amazing as did her tofu stirfry. This is definitely one of those places that made me rethink the type of dishes I could get. This past year when my mom and I went to Disney (which I am still so late to post up! 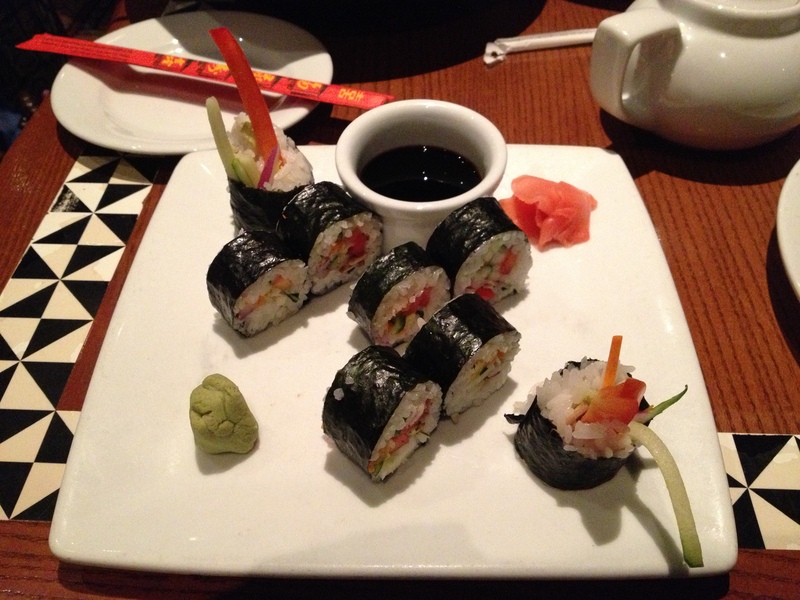 ), we went to ‘Ohana, and the chef brought me sushi as my appetizer. I wanted to see if that could happen again, so that was one thing I had emailed chef Johnny about. Similarly, the default gluten-free/vegan dish is a tofu stir-fry with a very rich sauce, and I asked if he could make it without the sauce (which he did). First up though were the “appetizers.” Both of us were able to have the GNI brand rolls. Unfortunately, they were totally improperly heated and were nice and warm on the outside….not so much on the inside. I think we both sort of picked at these. No matter, there were tons of other food options. We also could both have the salad which is now a papaya-mango salad. Very delicious, but of course it’s no honey lime dressing (which unfortunately would not be vegan)! 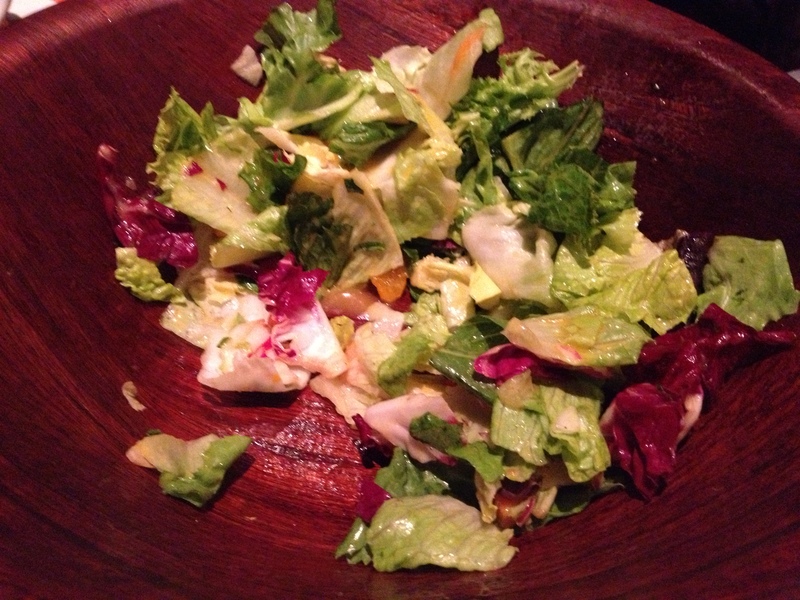 Still, ‘Ohana definitely provides a nice salad course. I always feel bummed because I have to limit my salad intake because of the Crohn’s. But it was definitely enough to satisfy my salad craving. Like Sarah, salad and I aren’t always the best of friends with the whole celiac disease, but I really enjoy the one at ‘Ohana. The rolls weren’t the worst round of GNI that I’ve had, but we picked at the edges and it seemed like enough for us. They also gave us some soy-based Earth Balance with them. If you’re soy-free, they give you a saucer of olive oil. As the appetizer course went on, this is where things began to vary. I had the chicken wings, which this time were dipped in sweet and sour sauce. Quite tasty. I asked for a small amount of these because it never fails that they bring me a ton of them, and I can’t finish them. This was the perfect amount. I was wowed by the vegan sushi! Talk about a really nice appetizer offering! Sushi is one of my favourite things, and though I’d like to say you can’t really mess up a veg-based sushi, well, you can. I’ve had sushi with terrible rice and brown avocado… not exactly fresh something to write home about. The rice was cooked perfectly, and it was loaded with veggies that were in a good ratio with one another. Served with pickled ginger (my favourite! Could eat jars of this all day), wasabi (which I love), and gluten-free tamari. As our main dishes came it was time to really dig in. I had rice, stir fry vegetables and grilled chicken and pork. I was also able to get the shrimp from the grill. As a gluten free & dairy free diner, I could also have the beef, but since I don’t really eat beef that one was out. I was also able to get the gluten free teriyaki sauce and sweet and sour sauce upon request. Chef Johnny was very accommodating at our table. One of the things I noticed about my shrimp was that they weren’t as spicy as they normally are. In fact, they were more “sweet and sour” than anything. After we left, I noticed that there have been some menu changes, and it looks like the grilled meats have been changed slightly. For example, the marinated sirloin steak (which is gluten free & dairy free) has now been changed to a Szechuan steak (which based on that evening, also safe). None of the others are considered safe, except the shrimp, but if you’re dining with others who don’t have a special diet, it’s good to note some of the changes. My main course was a lot of food — but I can’t say I was complaining! 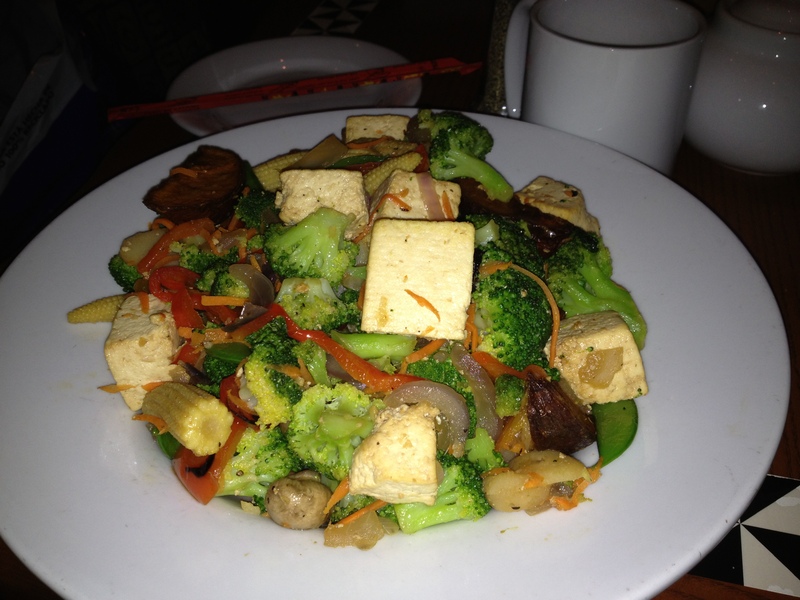 I had a huge, whopping bowl of stir-fried vegetables (and I eat a LOT of food… so anything I think is big, well, is huge. Trust me.) Chef Johnny said, “Your sticky rice is coming.” And I responded, “So wait, it isn’t under here?” gesturing to the vegetables… because it was so massive. The vegetables included broccoli, peppers, carrots, onion, baby corn, mushrooms, potatoes (which is always weird to me that they put them in, but taste good), and water chestnuts. The tofu is soft but flavorful, with a hint of meaty texture. The dish overall was just lightly seasoned–which is what I wanted–but generally can be served with a sweet sauce (likely the teriyaki sauce that Sarah mentioned). This photo does not do it justice–this was huge! The rice isn’t pictured. Overall, I liked my main course. I thought the veggies had decent flavor and were good well (and a little more “overcooked” which always appeals to my stomach with Crohn’s). The rice wasn’t a gummy mess like the last time I was there, so that was an improvement. I’m really liking that they are grilled the meats–they used to pan fry them. The grill really imparts some nice flavor. And of course, the shrimp were excellent, even if they were more sweet and sour like. I was seriously stuffed by the time I finished my entree. But, I was excited to hear there was a surprise for our dessert. Both Laurie and I were hoping for something different and exciting–more than just some Enjoy Life Cookies & Rice Dream. And Chef Johnny definitely delivered. 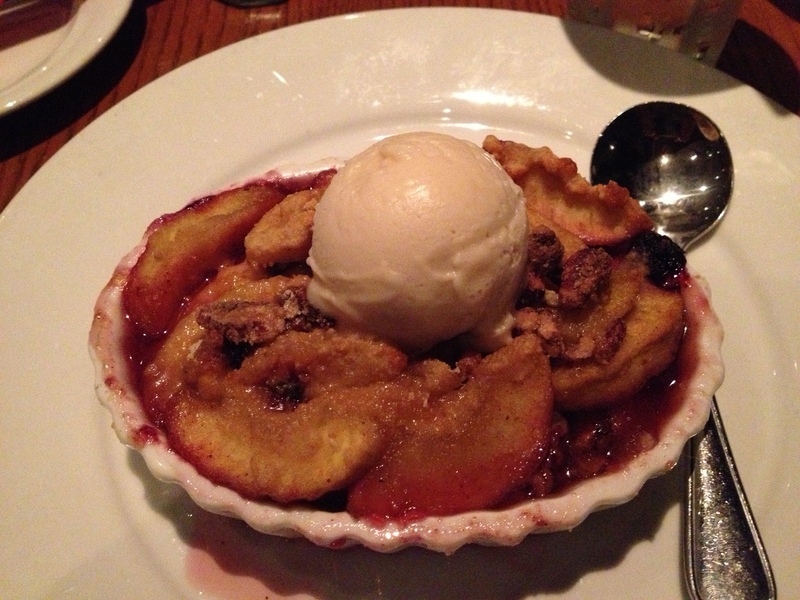 He brought out this delicious apple & blueberry cobbler with a pecan crumble and Rice Dream non-dairy ice cream. This was soooo good. I loved the flavor combination, and the Rice Dream was perfect on top. I will say, it was a little sweeter than I would have liked (there was a lot of sweet syrupy goodness in it) but overall, this was a welcome treat compared to so many of the same boring desserts you get at Disney. I wish I could have finished all of mine, but my stomach was plum full! It was really sweet, so the Rice Dream was the perfect way to offset it. But man, it was so good and a perfect, warming way to end our dinner together. Not only was this a terrific meal but it also brought some unique experiences. It also gave me some great insight to the vegan offerings available there. In the future, I wouldn’t hesitate to contact them ahead of time to see if they could make some type of dessert like this again too. That was perhaps one of my most favorite parts of the meal! Thank goodness Laurie did! Well, I do what I can to please! The truth is, I had one night in Disney and I was spending it with dinner with my friend… go big or go home, right? I’d give this visit a solid 8 out of 10. Though I will say we had a quite terrible server for the meal–thank goodness Chef Johnny was very attentive. Oh, yeah! I forgot. She certainly needs to be revaluated. My meal? Nine out of 10 based on it being ‘Ohana and not comparing it to other restaurants… losing a point for that server, but getting a bit of an edge for the company! Yet again ‘Ohana reminds me of why I love visiting. Good fun, good friends, good times! Mahalo! Postscript: I promise, those 2013 reviews are coming! First, your posts have given me so much help in planning our upcoming Disney vacation! I am vegan and gf too and it can be really hard to find info, as I’m sure you know. I was just wondering where your favorite counter service options were in each park this year (2013). I noticed those menus change a lot! Yes, sorry! I still plan on updating that, ugh, I am SO behind! I can give you more details on what I ordered, too! I am not sure if you are celiac and have to worry about cross-contamination, as well. I WILL get the posts done soon! When is your trip? Hi this is a great Post! I eat vegan and have booked Ohana restaurant for my family and I. How did you get in contact with the restaurant to make arrangements for a vegan meal? If possible would you be able to email me the contact details of chef Johnny/ the restaurant? Thank you for your Help! Happy Holidays! Hi, Casper! Contact Special Diets beforehand and they will give you all of the information. All of the information is listed on my section for eating here: https://lauriesadowski.wordpress.com/walt-disney-world-gluten-free-and-vegan!